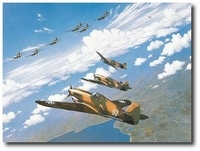 Overall size: 32" x 23 3/4"
Image size: 28" x 20 1/2"
Shortly after 9 a.m., 20 December 1941, on an airfield near Hanoi, ten Ki-21 type 97 heavy bombers roar skyward to deliver a load of bombs on Kunming. However, they were never to reach their destination. An intricate network of early warning communications had located them and tracked their progress as they approached the target. Approximately 130 kilometers from Kunming, the American Volunteer Group 1st and 2nd squadrons were alerted to intercept them. During the battle that was to follow, six of the ten bombers were destroyed and of the four that turned for home, only one made it back to safety. 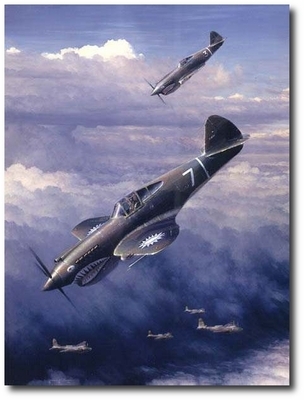 This was to be a great morale boost to the beleaguered Flying Tigers during those last trying months of 1941. Upon hearing of the victory, General Chennault was heard to explain to one of the pilots, "Next Time Get 'Em All." 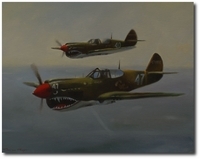 The painting depicts Bob Neale and his wingman W.E. Bartling during a diving attack on the Ki-21s. Bob Neale accounted for one of the victories during this action and went on to become the American Volunteer Group's top scoring ace.